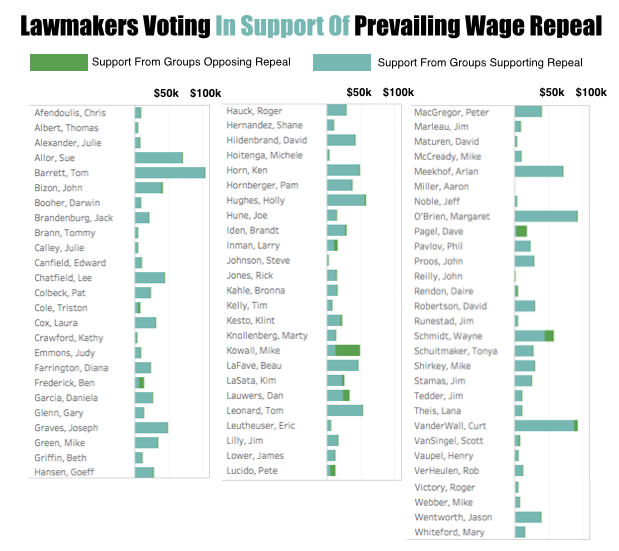 LANSING — When state lawmakers voted last week to repeal Michigan’s prevailing wage, the wide majority of them voted the way their fundraising reports suggested they would. The 53-year-old prevailing wage law sets pay standards for state-funded construction projects. Under the law, the standards are based on collectively-bargained rates for other projects. Groups that want to repeal the law say it unfairly inflates construction costs. Groups that support the law say it helps ensure that there are highly-trained workers to handle projects in Michigan. About 93 percent of state lawmakers ended up voting with the side of the debate that had previously spent more in support of their campaigns, according to a Michigan Campaign Finance Network analysis of 16 committees connected to organizations at the center of the debate. The organizations included eight committees tied to groups that led the fight for repeal and eight committees tied to groups that opposed repeal. All of the groups are active on multiple issues, and the two sides had spent close to the same amount overall. The vote in the Michigan Senate was 23-14 in favor of repeal. In the Michigan House, the vote was closer: 56-53 in favor of repeal. 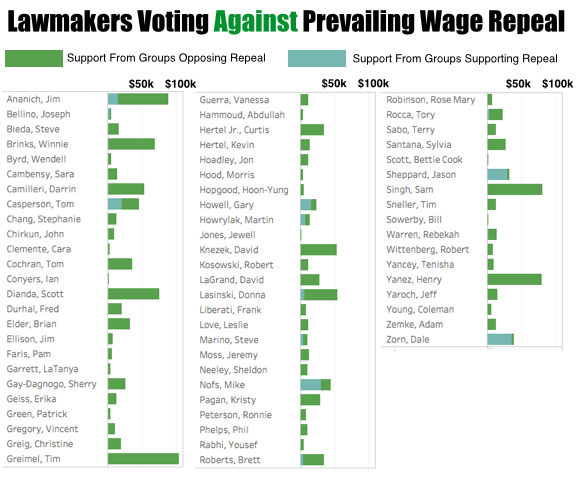 Of the 81 legislators who had received more financial support from the groups pushing to repeal the law, 75 voted to repeal it. Of the 65 legislators who had received more financial support from the groups hoping to keep the law in place, 61 voted to keep it. Over the last decade, the 16 committees tracked for this updated analysis had spent a total of about $5 million in support of the 146 lawmakers who voted last week and their four caucus committees. The total includes direct contributions to current lawmakers’ campaigns and independent spending in support of current lawmakers. The numbers don’t necessarily mean that the groups’ contributions changed anyone’s minds. But according to lawmakers and those involved in the debate, there were efforts to influence votes. Rep. Beau LaFave, a Republican from Iron Mountain, posted on Facebook that he was approached by a “union representative” who offered a contribution to LaFave’s leadership political action committee (PAC) if LaFave would oppose repeal of the prevailing wage law. In an email, LaFave, who doesn’t have a PAC, declined to identify the person who offered him the contribution in exchange for his vote because he said he didn’t want to get the person in trouble. But he maintained that there was a “clear quid pro quo” offered. He also said that lobbying efforts surrounding prevailing wage had been stronger than those on other issues. "When my response was no, things got even dirtier and I started to receive nasty calls and emails with threats," LaFave said. Steve Claywell, president of the Michigan Building Trades Council, which opposed repeal, said he had read about LaFave’s allegation. But Claywell said he had no additional knowledge of the situation. Claywell said both sides “were very active on lobbying on this issue.” Those opposing repeal included labor groups and many non-union companies and workers, he said. “At some point, this needs to stop,” he added. 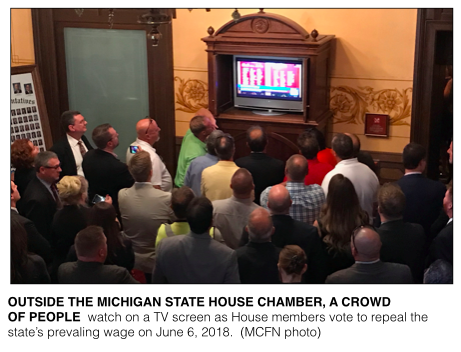 The Associated Builders and Contractors of Michigan, which led the campaign to repeal the prevailing wage, said on social media the moves makes “fair and open competition” the law of the land in Michigan for the first time in more than 50 years. The group helped fund a petition-gathering campaign that put the repeal proposal before lawmakers last week. The Associated Builders and Contractors also have a PAC and a Super PAC that have spent about $307,000 in support of current lawmakers over the last decade. In total, eight committees that supported repeal had spent about $2.43 million over the last decade, according to MCFN’s analysis. Of that total, $1.69 million came from the Michigan Chamber of Commerce’s PAC, which gives to candidates, or its Super PAC, which spent independently on things like mailers and ads. Of that $2.43 million, only about $32,000 — or about 1.3 percent — went to Democratic lawmakers who voted against repeal. On the other side of the debate, eight of the main committees that opposed repeal had spent about $2.57 million over the last decade in support of current lawmakers, according to MCFN’s analysis. The biggest spenders were the Michigan Regional Council of Carpenters PAC, which spent about $789,000 over the last decade, and the International Brotherhood of Electrical Workers PAC, which spent about $717,375. Overall, the eight committees spent most of their money to support Democrats, but they also spent $268,578 — or about 10 percent — in support of Republican lawmakers who voted last week. Nine Republicans received more support from those opposing repeal than from those supporting it. However, four of them still voted to repeal the law: Sen. Mike Kowall of White Lake; Rep. Ben Frederick of Owosso; Rep. Peter Lucido of Shelby Township; and Rep. Dave Pagel of Oronoko Township. Six Republicans who had received more financial support from those pursuing repeal voted to keep the law in place. They were Sen. Mike Nofs of Battle Creek, Sen. Dale Zorn of Ida, Rep. Joe Bellino of Monroe, Rep. Gary Howell of North Branch, Rep Martin Howrylak of Troy, and Rep. Jason Sheppard of Temperance. The following are the PACs whose spending was included in the tally. For repeal: Associated Builders and Contractors PAC ($26,9679); Associated Builders and Contractors Super PAC ($50,123); Friends of West Michigan Business, Grand Rapids Chamber, ($124,525); Michigan Chamber of Commerce PAC ($1.21 million); Michigan Chamber of Commerce Super PAC ($473,376); Michigan Freedom Network ($173,165); National Federation of Independent Business ($69,000); and Small Business Association of Michigan PAC ($71,550). Against Repeal: International Brotherhood of Electrical Workers ($717,375); Iron Workers Local 25 ($31,286); Local Union No. 58 International Brotherhood of Electrical Workers ($140,788), Michigan Building and Construction Trade Council ($17,260); Michigan Laborers Political League ($384,450); Michigan Regional Council of Carpenters ($789,800); Operating Engineers Local 324 ($479,706); and Plumbers Union Local 98 ($16,310).